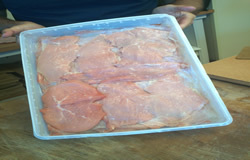 At Lombardi's Prime Meats we only use milk fed veal. Like our beef, our veal is not cryovaced. Our veal is hanging on a hook then broke down into sections. The sections include: Veal Cutlets, Veal Roast, Veal Chops, Veal Scallipini, and Veal Stew!